Dave Burt is an owner/operator of Treasure Valley Plumbing & Drain Service. 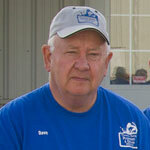 Dave moved his family to Fruitland and started a Sewer and Drain cleaning company in 1985. Dave is a Master Drain Cleaner with 30 years of experience. He is also a Building Contractor with over 40 years of experience. Customer service is a very important part of the business Dave and his family have built over the years.